We’re coming up fast into the thick of the holiday season. After Thanksgiving hits, I sometimes feel that I’m constantly surrounded by family and friends non-stop until the new year. Some parts of this are great, like feeling inspired by old friends I haven’t seen in a long time and getting a dose of my mom’s words of wisdom. Other things aren’t so hot, like being cooped up in my childhood home for a few days too long, with my nearly deaf dad who likes to watch TV constantly at full volume. Another frustrating thing I’ve discovered is how the holiday season can throw my writing for a loop. Traveling and staying in hotels means my schedule gets knocked out of whack. Cooking, cleaning, and preparing for guests means less free time and more stress. And, being around my family so much can generate all sorts of interesting inner turmoil that I thought I’d suppressed around the end of adolescence (what writer doesn’t have family issues?!). All these things can conspire to keep me from writing. Over the past few years, I’ve developed these tricks to help me maintain my work through the holiday haze. • Stick to your schedule: Grab it and hold on like a crazed Wal-Mart shopper on Black Friday. Whenever you prefer to write, be it in the morning, evening, or whenever, make that period sacred. Explain to your family and friends that writing is like a muscle you’ve got to keep from atrophying. Even if all you can think about is anticipating Grandma’s usual “So how is this writing “thing” going anyway?” speech, sit down at your typewriter, computer, or notepad and put some words down. Even if what you write makes you cringe, maintaining the writing impulse is crucial. • Write a certain number of pages per day: Different writers have different “normal” amounts of writing for a session of work. Whether you’re usually churning out a couple of finely tuned paragraphs or blasting through ten pages of rough draft, recognize where you’re at in a project and set a daily holiday goal. Make it attainable, and do your best to make it happen regularly. • Find a good workplace: No matter where you’re traveling to, seek out a place where you can do some writing when you arrive. This will keep you from having the excuse, “Oh, I can’t write in our hotel room because the kids are watching TV!” or something similar. Work in the hotel lobby. If you’re staying at a friend’s or family member’s, locate a café or library nearby. Don’t let new surroundings keep you from working. • Give in to the holidays: If the holidays have got you totally stuck on your current project, set it aside. Start a new story about a protagonist modeled on your crazy aunt who always gets soused at Christmas dinner. Write a poem about your annoying nephew’s expensive presents. Even though it might not be your next masterpiece, it will help get the holidays out of your brain and onto paper, so you can move on to something else. • Journal, journal, journal: Use your family and friends as fodder. Write down their mannerisms, ridiculous dialogue, and unlikely anecdotes to use as details in some future project. 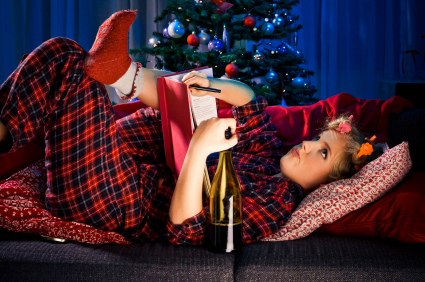 Writing down the holiday scene will distance it from you and let you take a step back from the holiday fervor. Joy Paley is a freelance writer based in Berkeley, California. She gave up chemistry research to write about science and technology issues, and she enjoys making the ethical and social aspects of science accessible to the public. In her free time, she enjoys writing fiction and personal essays. You can read her career musings on Pounding the Pavement. She also writes on the subject of technical schools for the Guide to Career Education.